No Comments, All Silverlight Examples, Farseer Physics Engine, Silverlight News, Silverllight Games, by Gavin Wignall. 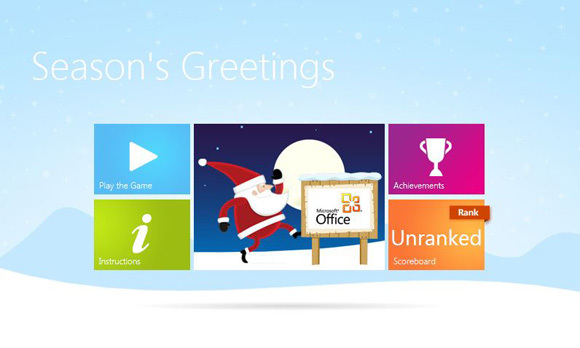 As the Winter months came upon us I once again, at Metia, had the opportunity to create a Festive game for the UK Microsoft Partner team. Through the success of last years game we were given more time and budget to make sure this years game stepped up a level. Go play the game! This was the perfect chance for me to use the Farseer Physics Engine. Farseer Physics Engine is a collision detection system with realistic physics responses, it is free to use and runs on the Silverlight platform. Being a festive game, I went for a Santa theme. 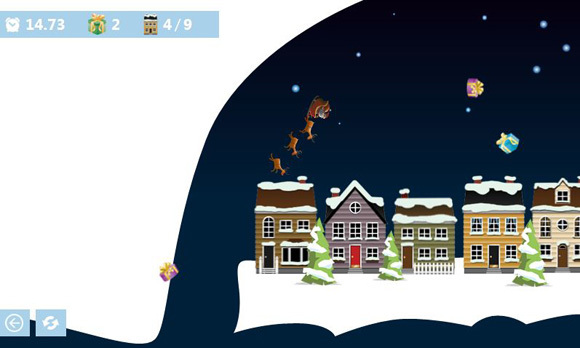 The general gist is to move the sleigh, collect the presents and then drop them into the passing houses. 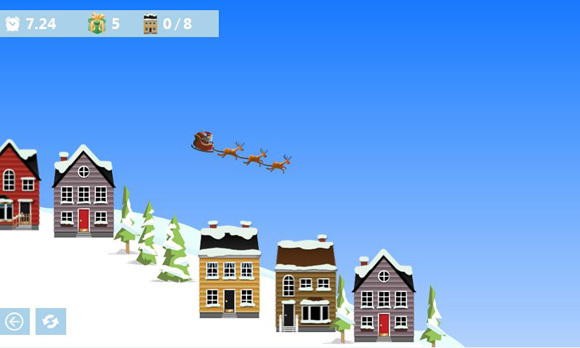 Your score is then based on the presents collected, the presents you delivered and the the time you complete the course in. 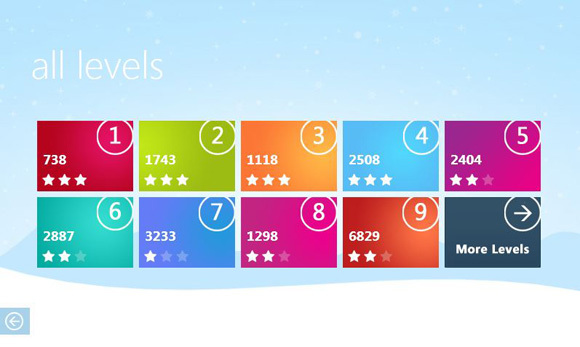 The game boasts 18 levels, with achievements and special unlock levels. 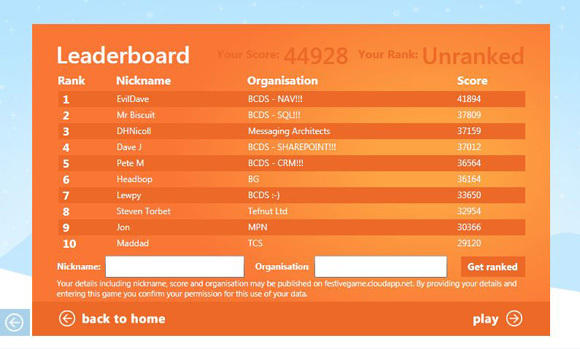 There is a global scoreboard that keeps track of your total score and ranks you accordingly. Microsoft Partners were given the chance to customise the game. 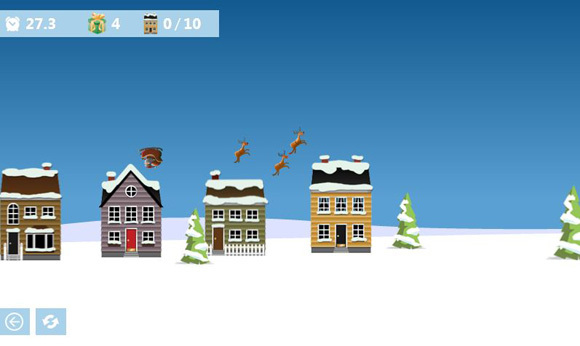 A customised version allows the Partner to add in their company name and logo to the home screen along with their logo featuring at the start and end of each level. While developing my WP7 game Bitbreaker, I tried and tested several methods to get a reliable game loop running. Many games require movement that is affected by constant changing factors. This often requires that movement to be adjusted on a regular basis. In arcade games, for example Bitbreaker, this action is required to happen many times each second. A game loop is the function that fires this repeatable action on a regular basis. I tried the following types of game loops while developing my Windows Phone App. This is a very simple way to create a game loop. Create a storyboard either in the XAML or in your code behind file. Set the storyboards duration to the amount of time you want delayed between each action. Set the storyboard to repeat forever. Place your game logic inside the function called on completed. This is a good way to ensure your game loop is called every possible chance it can as it matches your games frame rate. This is good way to control your game loop repeating at a consistent rate. Place your game logic inside the function called on each Tick. After trying all 3 methods on a Windows Phone, I found the DispatchTimer to be the best suited for my Windows Phone game. So while many people think Windows Phones are more suited for business users and the odd chore like comparing buildings insurance online, these results show that it’s more than suitable for gaming. I needed to get the fastest frame rate but also keep the movement in my game consistent. The dispatch timer achieved this very well. I found using the looping storyboard approach gave me a low frame rate as it required communicating with the XAML each time, even if there were no visible parts moving. I use the CompositionTarget.Rendering route often when creating games for the common desktop PC, this is due to it giving a very fast loop. However, when developing for the Windows Phone, we are using a much slower processor and can’t guarantee the frame rate will stay consistent. For Bitbreaker I required the ball to keep a consistent speed, using this approach would make the ball speed up and slow down when asking the game to perform different tasks of varying difficulty. 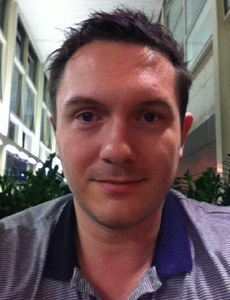 2 Comments, All Silverlight Examples, Silverlight News, Silverllight Games, Windows Phone, Working with Silverlight, by Gavin Wignall. My first Windows Phone 7 App has just gone live on the Marketplace. It costs only 79p / $0.99 in the UK/US so please go buy it and give me some nice feedback . Click here to view Bitbreaker on the Marketplace (you will need Zune installed). As this was my first attempt at producing a Mobile app, I knew I was in for some interesting learning curves. Because of this I decided that my first app should be based on the well established bat and ball style game. The level designs range from quirky retro designs honoring the game industries history to complex and tough mazes. The user is required to complete a level before unlocking the next one to play. During my progress I had several obstacles present themselves that I had to work around. The first one, that presented itself early on, was having to code for a mobile processor. Having created Silverlight experiences for desktop PCs over the last 4 years has somewhat spoiled me over the years, meaning I have not had to be too careful about how many times I check values within the XAML. I found with the Windows Phone platform that taking my usual approach to creating a game left me with an unimpressive framerate when testing on the device. I soon learnt my lesson and started storing data in arrays and variables, this meant my app only had to trawl the XAML tree when it absolutely needed to. I found that asking the app to create and then draw so many controls upfront was a big task. To get around this I placed the controls into the XAML and set their visibility to collapsed so that the app did not have to redraw them until I asked it to later on. The last problem was associated with the type of game I was creating. As I wanted to include blocks that were solid (could not be destroyed) I had the possibility that the ball could get stuck in an indefinite loop. To get around this I implemented a piece of code that checks to see if the ball has been trapped for a prolonged set of time and then adjust the balls trajectory slightly. This process is then repeated until the ball registers a hit with the bat.